While Hanoi has successfully exported some of its best recipes to the outside world, pho is a prime example, a handful of its delicacies remain hidden, available to only the city’s connoisseurs. Banh cuon Thanh Tri is one of those under-the-radar dishes. What Exactly Is Banh Cuon Thanh Tri? These words might look exotic until you realize that it signifies only the name of the dish (banh cuon) and the village that it originates from (Thanh Tri). Banh cuon, which means steamed rice crepes or steamed rice rolls in English, is thin rice flour crepes with or without fillings inside, served hot or cold, while Thanh Tri is an ancient community on the bank of Red river. Original banh cuon Thanh Tri has no fillings and is usually served cold. Thanh Tri village is not blessed with much fertile soil conducive for rice cultivation so the local citizens came up with banh cuon Thanh Tri to make ends meet. Despite its humble start, the silky soft rice crepes eaten with fried shallots and dipping sauce have become the favorite breakfast of generations of Hanoians, only lose their popularity recently to newer dishes more appealing to modern tastes. The simple ingredients of banh cuon Thanh Tri may not sound as inviting as hearty beef pho or flavorful bun cha with its hunks of char-grilled meat patties. However, its simplicity is what haunted expatriate native Hanoians who cannot find this taste of home anywhere else outside of this city. Much like bun cha, banh cuon Thanh Tri stands or falls on how well the dipping sauce is made. 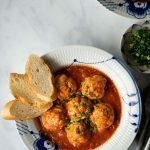 With only fish sauce, vinegar, and sometimes sugar, the key here is to hit the correct balance as the first rule in making this kind of sauce is that no flavor should overpower others. To further enhance the taste of the sauce, a few drops of belostomatid’s aromatic essence (tinh dau ca cuong) are added. No matter how greatly praised this addition is, I still find it hard to wrap my head around the idea of eating something produced from a giant bug, especially when I had taken a glimpse of them before indulging in my steamed rice crepes. 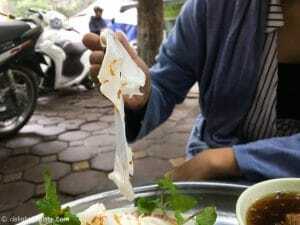 Another feature that makes the reputation of banh cuon Thanh Tri is the rice crepes themselves. The best crepes must be thin and translucent but at the same time, firm enough so that diners can pick them up easily with chopsticks. This point of perfection in texture calls for one exact type of rice, the right ratio of water and flour, and the dexterity of the cook. Khang Dan rice is compulsory in the making of good banh cuon Thanh Tri. The rice is soaked and then milled with water to create the batter. By the look of it, steaming sheets of rice crepes seems really easy. All you have to do is to spread a ladleful of batter on a thin cloth stretched over a pot of boiling water, wait for it to be cooked and then coax it off with a long chopstick. However, this set of skills takes years to perfect. This is partly why banh cuon Thanh Tri is so rarely seen even in Hanoi, as not everyone gets what it takes or the right recipe to make the perfect rice crepes. Traditional method to steam banh cuon on a cloth stretched over a pot of boiling water. You can see the steps to steam the rice crepes in the photos above. No, it wasn’t any artisan steaming the crepes in the photos. It was just my mom making them at home. I took these photos 7 years ago so the quality is terrible, but you get the idea. 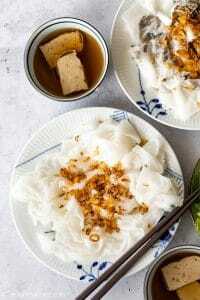 Nowadays, people can make decent banh cuon at home on the stovetop with a nonstick pan, but the taste and texture are not comparable to the crepes cooked in the traditional way. Modern preferences aside, as recently as a few decades ago, female vendors hawking banh cuon Thanh Tri on the streets of the old Hanoi was still a common sight. Not much was needed to keep such mobile stalls going; a basket with pre-made rice crepes, a bottle of fish sauce, another bottle of rice vinegar, and some red chili. Hanoians liked to have their banh cuon with fried tofu cubes, a habit that may sound a little weird in other parts of Vietnam but this combination used to be so popular that there were stalls set up just to fry tofu for banh cuon Thanh Tri eaters. A more popular version of banh cuon Thanh Tri is still the pale and semi translucent rice crepes but they encase ground pork, wood-ear mushroom and are served hot. Authentic banh cuon Thanh Tri is getting harder to find, but these steamed rice rolls with fillings are readily available anywhere you look in Hanoi, making them the perfect choice for a quick and light breakfast or lunch. People often prefer the steamed rice rolls with fillings version because they are more substantial for a meal. While this is a nice addition to Hanoi’s vibrant food scene, these newer steamed rice rolls do not have the depth of history like its predecessor. Even so, the new version, which is also my and many other people’s favorite, is slowly pushing the old fashion banh cuon Thanh Tri to the side. Plain steamed rice crepes topped with crispy fried shallots. You can also see a plate of steamed rice rolls with fillings in the background. However, as everything has two sides to it, the lack of fillings in traditional banh cuon Thanh Tri is, at the same time, its biggest advantage. 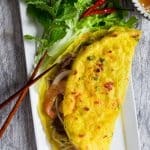 Without the distraction from the strong taste of ground pork and mushrooms, diners can focus more on the softness of the crepes and a predominant flavor of the dipping sauce complemented by crispy fried shallots. It is also very difficult to find a place that still serves banh cuon with fried tofu these days. For a while, people have been eating steamed rice crepes with pork sausage (cha que) and pork floss (ruoc). Now after being back in Vietnam for a few months, I’m taken aback to see some places even serving banh cuon with grilled pork and squid cakes. How did all that happen? 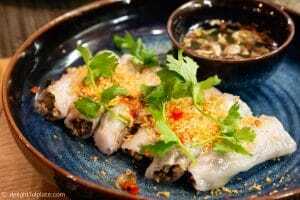 So where to savor banh cuon Thanh Tri in Hanoi? Grandma Hoanh’s stall is one of the last places anyone can find traces of the once-famous banh cuon Thanh Tri in Hanoi. I said traces because unfortunately, it has altered itself a bit to suit modern palate in order to survive, thus lose some of its authentic traits. 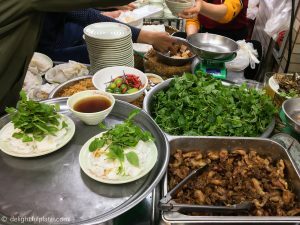 Here you can still find the slippery steamed rice crepes that make the name of banh cuon Thanh Tri but the iconic aroma of rice and the thinness are long gone. It is probably because machinery is used now to automate parts of the process, depriving the crepes of its intricate handmade feel. My first experience with banh cuon Thanh Tri was also at Grandma Hoanh’s stall at number 66 To Hien Thanh Street. And like other Vietnamese eaters, I paid attention to the dipping sauce before anything else. Grandma Hoanh’s amber-like colored sauce leans toward the savory side so it was complementary to the simple rice crepes. At first, it seemed heavy with the taste of fish sauce, but then the depth came through and there were subtle sour and sweet. Grandma Hoanh’s stall is in close proximity to the Old Quarter and open all day so it is where you want to head to if you want a quick fix of banh cuon Thanh Tri. 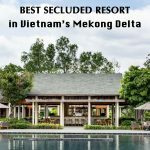 If you can manage to go a little farther beyond the area around the Old Quarter and can get up really early in the morning, I mean like 4:30 a.m. kind of early, I heard there is a more authentic place to try. Still the bamboo basket with steamed rice crepes, fish sauce, vinegar, herbs, and crispy fried shallot, Grandma Nga’s stall is one of those that still honor the tradition of making banh cuon Thanh Tri totally by hand. Her diners are mostly the elderly of her age who come to her mobile stall at number 307 Bach Mai Street every morning for not only a light breakfast but also a friend to talk to. 30 years of making banh cuon has given grandma Nga the unique skill set to recreate the virtues of the glorious banh cuon Thanh Tri that Hanoians hold dear in their hearts. While I am glad that there is still someone left to preserve banh cuon Thanh Tri’s legacy, I cannot help wondering, what will become of this Hanoi’s delicacy when the last generation of people like grandma Nga pass away? Banh cuon is definitely a must try food in Hanoi. Most of the places selling banh cuon in Hanoi including those mentioned above are street food stalls, which don’t have very high food hygiene standards I must say. If you prefer clean sit-down restaurants with a nice setting, I recommend the steamed rice rolls at Red Bean Trendy near Hoan Kiem Lake. 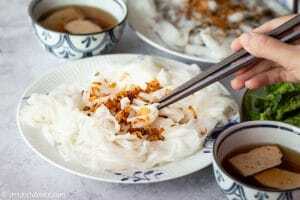 The banh cuon here is not the traditional Thanh Tri version, but it is very delicious with pork and mushroom fillings, topped with shrimp floss and fried shallots.